Last Monday I showed you how I restored our fire pit by adding some new sheet metal to the ash pan and spray painting it. I realized that we barely use our fire pit – especially in the summer. Not only that but we currently have a burn ban going on in my county so I can’t have a fire even if I wanted to. We love sitting by the fire on cool fall nights but that will be a few more months before that happens. So I decided to make a removable table top so we can enjoy our space a bit more. I went to Lowes and picked up some cedar boards to create a beautiful outdoor coffee table top that fits perfectly over my fire pit. Now I am guessing I am the only one who is probably jazzed about this table! I mean, after all, what are the chances you have the same fire pit that I do? None. But I am just so stinking proud of myself that I overcome my fear of building. I love Ana White as a person. But her magical building skills have always left me wanting. But today I actually accomplished building a piece of furniture that didn’t look like crap so I am doing the happy dance. Won’t you happy dance on my behalf even if this project won’t work for you? Ahhhh you’re the best! I love the wood grain in the cedar table. Isn’t it beautiful? I loved how it added to my outdoor living space and picked up on the dark wood of my newly stained deck. After speaking at the Haven Conference and going to the Kreg Jig booth I decided I must have one. So I went to Lowes and purchased one for this beginner Kreg Jig project. I also purchased cedar 1” x 4” boards because cedar holds up well in all types of weather when properly sealed. My fire pit is a 3’ square. So I cut enough boards for the entire piece to hang over on each side by 1 1/2”. I laid out all my boards first to see how it would look and I love all the variances in the wood grain. 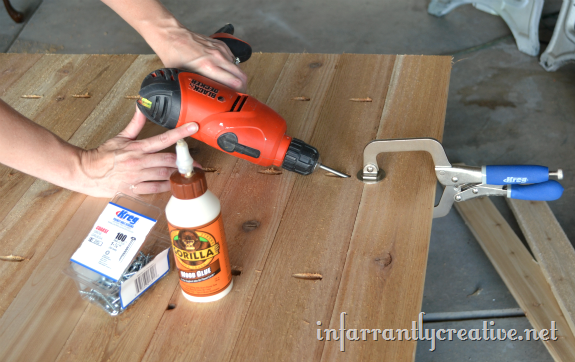 I flipped all the boards over and then I used my Kreg Jig to bore holes into the wood and then used some Gorilla Glue wood glue and connected them all with the Kreg screws. Next I built the apron, using the Kreg Jig, to go under the table to fit just perfectly over the top of the fire pit. Then I gave all the pieces front and back a coat of Minwax Pre-wood Conditioner followed by a coat of Minwax stain in English Chestnut. I chose this color because it was a perfect medium brown with no red tones to it. Then I followed that up with three coats of Rust-Oleum’s Spar Varnish which is made specifically for protecting outdoor surfaces. 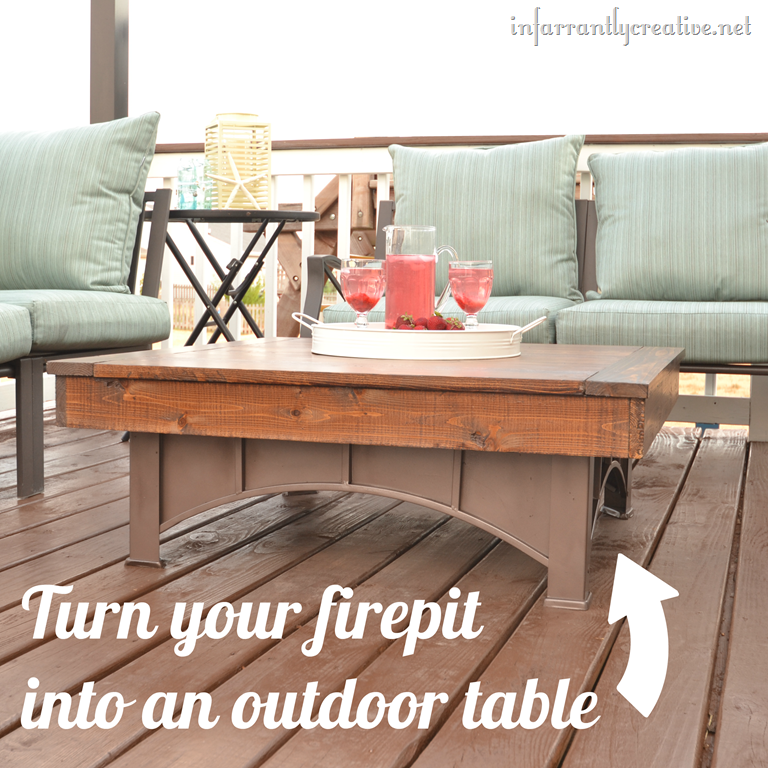 Now we just store the fire pit grate cover under our deck and popped our new tabletop over the top of the fire pit. I think the tabletop is way more conducive for the space but I love that I can convert it by just removing the tabletop to reveal the fire pit underneath. My outdoor sanctuary is shaping up quite nicely. Now I need to find some pillows to give it that pop of color. Did you know you can get the Lowe’s Creative Ideas magazine on your Ipad or Iphone? I just downloaded mine this week, check it out! Disclaimer: As one of Lowes Creative Ideas bloggers I was challenged to ramp up my outdoor space this month. I received a gift card to Lowes as compensation for this project.